In November 1943, Marine 1st Lt. Alexander Bonnyman, Jr. was mortally wounded while leading a successful assault on a critical Japanese fortification on the Pacific atoll of Tarawa, and posthumously awarded the Medal of Honor, the nation's highest military honor. The brutal, bloody 76-hour battle would ultimately claim the lives of more than 1,100 Marines and 5,000 Japanese forces. But Bonnyman's remains, along with those of hundreds of other Marines, were hastily buried and lost to history following the battle, and it would take an extraordinary effort by a determined group of dedicated civilians to find him. In 2010, having become disillusioned with the U.S. government's half-hearted efforts to recover the "lost Marines of Tarawa," Bonnyman's grandson, Clay Bonnyman Evans, was privileged to join the efforts of History Flight, Inc., a non-governmental organization dedicated to finding and repatriating the remains of lost U.S. service personnel. In Bones of My Grandfather, Evans tells the remarkable story of History Flight's mission to recover hundreds of Marines long lost to history in the sands of Tarawa. Even as the organization begins to unearth the physical past on a remote Pacific island, Evans begins his own quest to unearth the reclaim the true history of his grandfather, a charismatic, complicated hero whose life had been whitewashed, sanitized and diminished over the decades. On May 29, 2015, Evans knelt beside a History Flight archaeologist as she uncovered the long-lost, well-preserved remains of of his grandfather. And more than seventy years after giving his life for his country, a World War II hero finally came home. “Beautifully written. 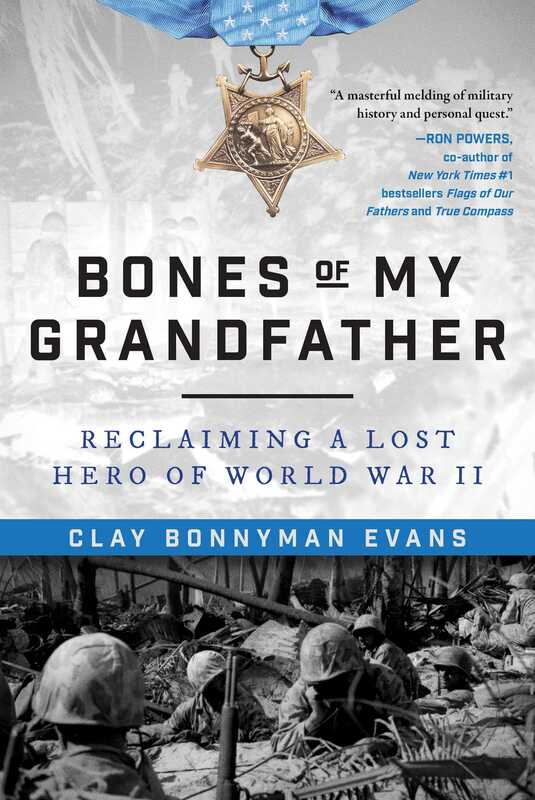 Clay Bonnyman Evans expertly weaves the quest to learn who his grandfather was and the truth about the posthumously awarded Medal of Honor with the current day search for his grandfather’s remains. The result is a seamless, well researched story of discovery. Evans uncovers the man behind the legend – his strengths and flaws. Evans’ relentless pursuit of truth removes the shadow from his grandfather’s legacy. His candor reveals that the devastation of war wasn’t limited to the battlefield but ripped into the heart of his family, destroying lives here at home. And finally, Evans openly discusses the frustration of dealing with competing government agencies whose focus isn’t always on accomplishing the job at hand.